On the Friday following the assassination of the Prime Minister, the 15 May, John Bellingham was in court but to answer a charge of murder. His trial at the Old Bailey was presided over by Sir James Mansfield, the Lord Chief Justice of the Common Pleas. 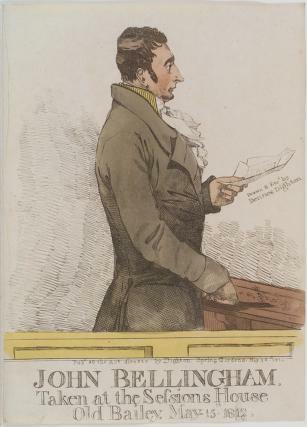 Mr Peter Alley, Bellingham’s chief counsel, tried to have the trial postponed on the grounds that they had not been given sufficient time to prepare for the case saying that he had only been given the case the day before and that he had never even met Mr. Bellingham until that very day. He asserted that given adequate time, in particular to find medical experts and witnesses in Liverpool who knew Mr Bellingham personally, he was confident he could prove his client to be insane. The Attorney General, Sir Vicary Gibbs, on behalf of the prosecution, argued vehemently against any such postponement. Mr Allen’s request was unsuccessful and the trial proceeded. The Attorney General in presenting his case argued that the Government had been aware of what had happened to Mr Bellingham in Russia, had examined his claims, and had rejected them. He also rejected any notion that Bellingham was insane since he had been well able to conduct his business and had been trusted by other to conduct theirs without any hint of insanity on his behalf. When his time came to speak, Bellingham said first of all that he was pleased the judge had not accepted his counsel’s arguments alleging his insanity. Once all the witnesses had been examined (closing arguments by the defence and prosecution were not allowed at that time), Sir James Mansfield addressed the jury, during which he became openly emotional and at one point cried. 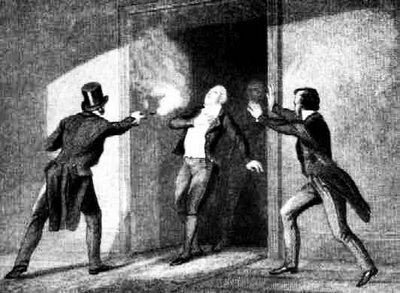 ‘Gentlemen of the jury, you are now to try an indictment which charges the prisoner at the bar with the wilful murder (here the learned judge was so hurt by his feelings, that he could not proceed for several seconds) of Mr. Spencer Perceval, (in a faint voice) who was murdered with a pistol loaded with a bullet; when he mentioned the name of (here again his lordship was sincerely affected, and burst into tears, in which he was joined by the greatest portion of the persons in court) a man so dear, and so revered as that of Mr. Spencer Perceval, I find it difficult to suppress my feelings. He dismissed any idea that John Bellingham might have been insane at the time of committing the crime, saying that on the contrary, the testimony adduced in his defence had most distinctly proved that he was in every respect a full and competent judge of all his actions. It was no surprise then that John Bellingham was found guilty of Spencer Perceval’s murder. After a consultation of two minutes and a half in the box, the jury expressed a wish to retire, but took only fourteen minutes to reach a verdict. 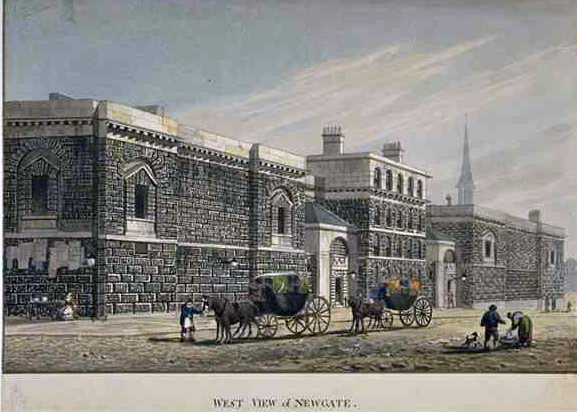 On the following Monday, 18 May, John Bellingham was hanged in public outside Newgate Prison and his body sent for dissection to St Bartholomew’s hospital nearby. There have been three books about the assassination, the first, The Assassination of the Prime Minister: The shocking death of Spencer Perceval by Molly Gillen was published by Sidgwick and Jackson in 1972, and the second, The Assassination of the Prime Minister: John Bellingham and the Murder of Spencer Perceval by David C Hanrahan was published by The History Press in 2008. The third, Why Spencer Perceval Had to Die by Andro Linklater was published by Bloomsbury in 2012. Linklater adds little to the facts explored by the two previous authors but he explores the possibility that although Bellingham insisted that he wasn’t part of a plot, it was an obvious possibility. Working-class discontent seethed as a result of the harsh economic climate caused by the Napoleonic Wars, and was manifested in the outpouring of popular applause and hurrahs for Bellingham that greeted the news of the assassination when it reached the streets. William Cobbett, who was at that time imprisoned for political libel, saw from his cell ‘mournful tears’ running down the faces of the crowd at the public execution and ‘heard the unanimous blessings’ and gratitude to Bellingham for having ‘ridded’ them of ‘the leader amongst those whom they thought totally bent on the destruction of their liberties’. But no evidence was ever found of any radicals’ complicity in the murder. Linklater’s alternative theory is that Bellingham must have had financial help during the five months he spent in London seeking redress for his grievance. Although he was supposed to be impoverished, Bellingham paid his bills and did not live frugally. These sponsors, who must have known of Bellingham’s murderous intent, may have stood to gain if the ‘orders in council’ banning all trade with France were rescinded, and that Perceval’s assassination was the means to achieve this. Although Linklater names the conspirators, he produces no hard evidence, so the theory hardly adds up to much of a conspiracy. 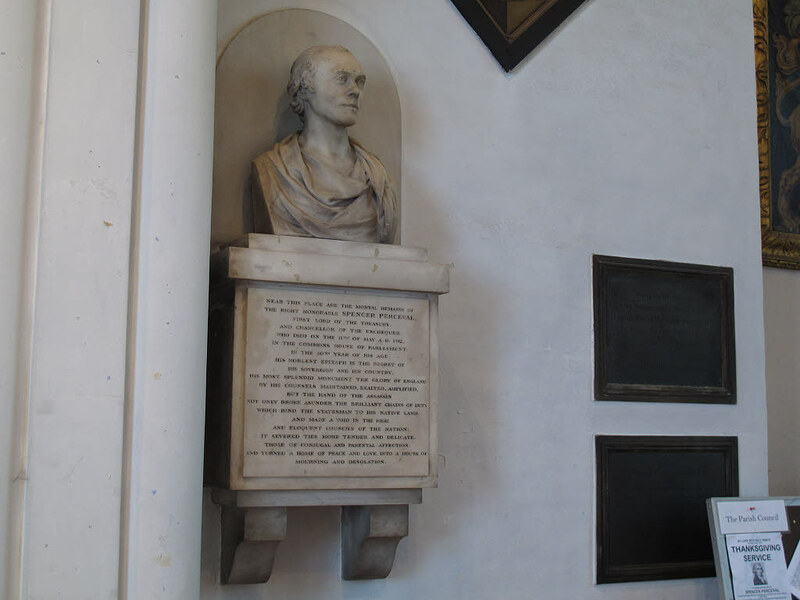 Bust and memorial to Spencer Perceval in St Luke’s Anglican parish church in Charlton, London. The body is buried in the sealed family vault under the floor of the church. Perceval was buried on Saturday 16 May, the day after John Bellingham’s trial, in the Egmont family vault at St Luke’s Church, Charlton in south-east London. Perceval was the seventh son of the second Earl of Egmont, a title in the Peerage of Ireland. At his widow’s request, it was a private funeral. There were soon rumours that he had not left his widow, Jane, and his twelve children aged between three and twenty, well provided for. He had just £106 5s 1d in the bank when he died. On the 13 May, Parliament voted to settle £50,000 on Perceval’s children, with an additional annuity of £2,000 for his widow which on her death would transfer to the oldest son, also called Spencer. 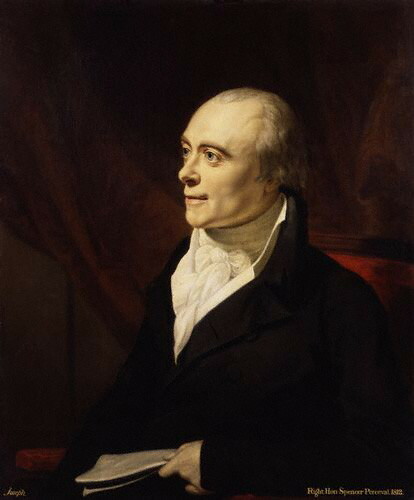 And on 15 May, after a some wrangling between the Whigs and Tories, the Commons further agreed to erect a monument to Perceval in Westminster Abbey, and for the younger Spencer Perceval to receive an annuity in his own right of £1,000 per annum to date from the previous Monday, the date of his father’s death. Three years later Jane Perceval married Lieutenant-Colonel Sir Henry Carrand, but was widowed again six years later. She died aged 74 in 1844. In a curious echo from the past, Henry Bellingham, who is descended from a relative of Bellingham’s, was elected in 1983 as the Conservative Member of Parliament for North West Norfolk. But in 1997 he lost the seat by 1,339 votes to the Labour candidate, and this could be attributed in part to the 2,923 votes received by the eurosceptic Referendum Party candidate Roger Percival, who claimed, despite the different spelling, to be descended from Spencer Perceval. At the time The Independent depicted the local contest, which focused heavily on Britain’s role in Europe, as a conflict between the descendants of the two protagonists from two hundred years previously. This time ‘the roles are reversed with Roger Perceval the assassin lurking in the wings ready to strike at an increasingly nervous Henry Bellingham’ and that it was Labour’s Dr George Turner ‘who could gain the ultimate prize from Mr Percival’s assassination of Mr Bellingham’s election hopes’. However Henry Bellingham was re-elected in 2001, and remains the MP for the North West Norfolk constituency. He was Parliamentary Under-Secretary (Foreign and Commonwealth Office) from 2010 to 2012. He recently failed in his bid to become Deputy Speaker of the House of Commons.